Cels from the scene where Jonny and Hadji don life vests on the burning "Sea Quest" (see screen grab from the episode at right). Note: the background painting in the cel above is the inside of the hut in Thailand from the "Double Danger" episode. Here's another cel from the same scene; note the subtle differences in Hadji's hand and head positions between the two cels. The cel of Hadji at far left is from a bit later in the same scene, just as Hadji, Jonny, and Bandit are jumping off the ship (see episode screen grab at right). (image courtesy Joel Elkins). The cel at left of Jonny and Bandit is from the same scene, at almost the same point, showing Jonny, and Bandit jumping off the ship. Compare this cel to the screen grab above. Cel from the scene where an ape scares Bandit who jumps into Jonny's arms (see episode screen grab at right). Animation cel from the scene where Jonny, Hadji and Bandit attempt to escape from the tree people by floating away on a log (see episode screen grab at right). Animation cel from the scene where Jonny gives it the ol' college try on the swinging vine, but ends up making a big splash (see screen grab at right). Note in the actual episode this cel was only partially visible on the screen. According to the seller, the image size of Jonny is 4.75 by 5 inches; the entire cel measures 10.5 by 12.5 inches. Animation cel from the scene where the would-be kidnappers hold Dr. Quest and Race at gunpoint; that's why Race's arms are raised in this image. (see episode screen grab at right). 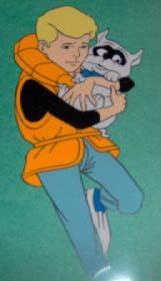 Another animation cel from the scene where the would-be kidnappers hold Dr. Quest and Race at gunpoint; just after the cel shown above (note the hand that was reaching toward Race's shoulder in the first cel's episode grab has now reached his shoulder (see episode screen grab at right). (Image courtesy of Kurt Oblinger) Animation cel from one of the scenes where the boys' new friends lend a hand. (see episode screen grab at right). Interesting note: We never see the entire cel (as shown at left) in the aired episode; the lower part of the cel was off-screen.